The beautiful courtyard offers a unique tranquil setting and the original Oriel House is a listed building dating back to 1805. It has lovingly restored and sits comfortably alongside the contemporary new development. Extensive facilities include, Powder Keg Bar, Exclusive Leisure Club and fully equipped Gymnasium.This is a Non Smoking Hotel. 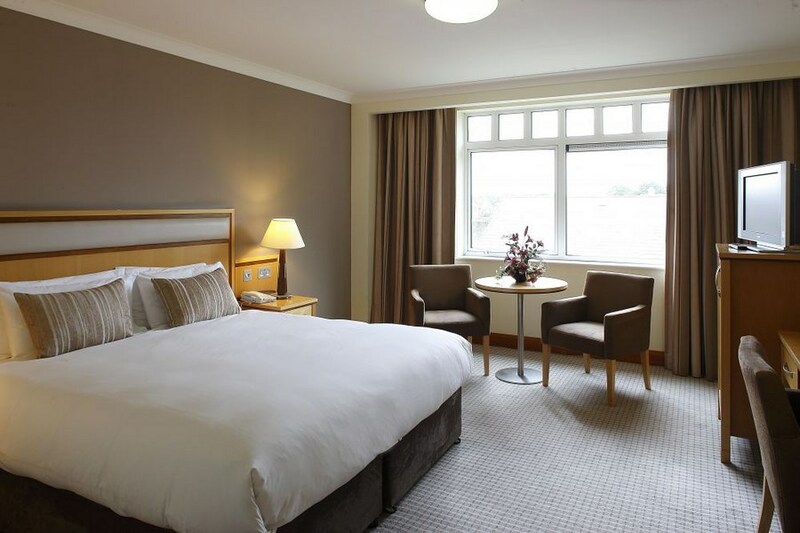 The hotel is situated in Cork's Ballincollig village on the west side of Cork City. The Oriel House Hotel is within close proximity of Cork Airport , Blarney, award winning golf courses and is a great gateway to Co Kerry. Fabulous hotel with amazing staff, all friendly & hardworking. We had evening meal included in our rate & it was gorgeous, restaurant staff swopped my dessert choice for a cheese board instead without a quibble. Receptionist was lovely as well, I rang beforehand & explained I'd back surgery in November & didn't want a shower inside bath tub & she gave us a perfect room. I really liked this hotel & definately plan on returning. Staff is very friendly and attentive. The rooms are big, clean and nicely furnished. Good joice of breakfast. We would come back anytime again. Great hotel for family break, lovely pool and gym, class food. We loved it! Beautiful hotel in a really nice village, rooms spotlessly clean and staff friendly and helpful. Bar food delicious and hotel in close proximity to Ballincollig village. We had a lovely two day stay and would highly recommend the hotel. Had a lovely stay at the Oriel House Hotel with my husband & 2 children. Staff were pleasant and very helpful. Enjoyed a lovely breakfast & bar food one evening. Great kids pool. We would definitely return to this hotel. A great hotel to stay in. Stayed as part of a B&B package. We ate with friends in the Hotel restaurant. Dinner & breakfast was 100%. All hotel Staff very friendly & helpful. The Pool was the best for children, nice and warm and there was pool toys for the Children. Leisure Staff were so helpful. Only stayed one night which was too short! but the staff were very helpful and friendly the room was really comfortable the leisure facilities were very good a really great place to stay look forward to going back!! Really enjoyed our stay in the Oriel House Hotel. Could not recommended highly enough. Staff were extremely friendly and efficient. Food was fabulous and there was a great atmosphere in the hotel. Our room was spotless and bed was comfortable. I would definitely stay in this hotel again. My mother and I really enjoyed our trip to Oriel House Hotel. We had a lovely room looking out onto the countryside, a lovely en-suite which contained a shower and bath. The staff were extremely friendly and helpful. Food was lovely and excellent music in the bar that night. lovely hotel. Rooms very clean and comfortable. Food was excellent. Excellent value for money and Ballincollig is a lovely village and Cork city is only a short drive away. Highly recommend. very poor service. Breakfast poor. Hot food served on a cold plate. Service very slow in bar /restaurant. My friend & I stayed here for two nights & were very disappointed with the food and service. We stayed there last year & it was fine but not any more. The hot breakfast was served on cold plates. The kippers were served warm on top with cold spots on the bottom. Porridge was watery. Service for food in the bar was very poor left waiting for long periods. A glass of wine was served using a measure which I had never seen used anywhere. My friends room was cold & she was unable to have a shower. Definitely wont be back. Stayed for two nights. The staff could not do any more for us. Thank you. Very family friendly hotel. booked a double room for myself and fiancé, got a room with 2 single beds pushed together,which meant we could not sleep near to each other due to the ridge in the middle of the 2 single beds. Straight away our getaway became less romantic. that afternoon @ 4.30pm we went had food in the hotel bar and our waiter was in no way friendly, helpful or bothered about us or in fact any customer he served. The food was we received was tasteless of tiny portions, however the barman who took our bill payment very kindly offered to give us a reduction even though we hadn't complained, merely replied with honesty when asked if we enjoyed our food. We were so hungry after travelling and poor bar food that we had to go else where to eat. The worst part of all was the' Constant LOUD noise' from 10.30pm - 8am coming from an inspection point in the room. when we opened our window to have fresh air during the night, we were met with another constant LOUD noise the fans from the restaurant/bar. This gave us a bad headache and sleepless night, and put us in a foul mood with each other! regretfully we waited until check out to give our disappointed feed back. The excuse we were given was that the room we were given was in the old part of the hotel!!!!!!! Which quite frankly is a pathetic excuse! it seemed as though they gave us the most inadequate room available! We received an apology from the manager but that was the only gesture received, we paid in full and suggested they sort out that room for future guests if they really had to use it! We had a stressful stay @ this hotel and wasted journey as well as money wasted. Such a let down as we assumed the accommodation would match the beautiful lobby entrance. Maybe rooms in the new part of hotel would be better but don't forget to specify you would like an actual double bed if you and your partner are booking. very poor experience here. I hope other customers will not be treated in such a bad way! Beautiful hotel. Rooms are lovely & spacious. Food in the restaurant is very good. Bar area is nice too. Staff at this hotel are really friendly & efficient. Children are very welcome. Leisure centre is excellent. Ballincollig itself is a lovely area, it has something for everyone & plenty to do for children. We will definitely return & highly recommend this hotel. Top class break for an affordable price. 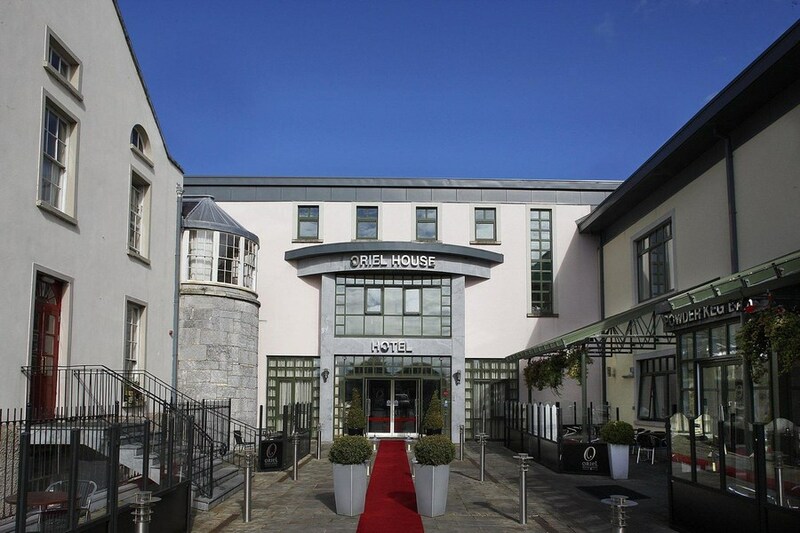 Really beautiful hotel in the stunning town of Ballincollig. Rooms were really spacious, very clean and very modern. Bathrooms were beautiful and lovely bath with seperate shower. Room had all the mod cons including, lovely little choc chip cookies with the tea/coffee and a few bottles of water. The pool, jacuzzi, steam room and sauna were fantastic. We will definately be coming back with the kids. Hotel is in a great location to the town (within walking distance). The hotel also has a luxury spa, that offer special deals, unfortunately you will have to book in advance, but the treatments all look lovely and reasonably priced. Very nice friendly and helpful staff. Food lovely. Room lovely and spacious and clean. Excellent power shower. Would definitely recommend. Exceeded all expectations, spotlessly clean, staff were great, pool area excellent for kids and powder keg bar and restaurant plenty of room with great food. Overall we couldn't fault the hotel and staff, they even gave our two kids free cornflakes before bed. We will be back again soon. AAAAAAAAAAAAAAA very enjoyable ,excellent staff, very helpfull. the hotel we found was very nice, there was a couple of things with the room 1. my wife found the room a little chilly in the night, 2. we found it a little unusual that their was no phone in the room, we had dinner in the bar on Friday evening, my wife is not a big eater and asked for a half portion the lad that served us just said no that cant be done instead of going and asking the chef, i had the steak i was a little taken back when it was served as their was very little on the plate for the price we paid, other than that i would recommend this hotel the facilities were very good.it was ideal what we were looking for just a total chill out. Very family friendly hotel, our room was very spacious and comfortable. Staff friendly and very accommodating. Free kids club each evening was a huge bonus and our children loved it. Would definitely return. Great family room, and kids club, very friendly staff, would retrun for another stay and would recommend to a friend. Stayed here for one night as a birthday treat. Great location, very convenient. Excellent swimming pool and leisure centre. Spacious room and bathroom. Although there was a wedding in the hotel that night, didn't experience any noise. Great variety at breakfast, self-service. I would return and highly recommend this hotel to couples or families. The only negative comment I have, is that the reception staff could be more friendly. Thanks for a great weekend. Stayed here last weekend in a family room, 2adults plus 2 children. Beautiful room, plenty of space and spotless. This was my 3rd stay at this hotel and as with previous visits, flawless. From check in to check out every member of staff were so friendly, have recommended this hotel to work colleagues who were also very impressed. Top marks to the Oriel House Hotel! I stayed here on May Bank Holiday weekend with my husband and 2 children aged 5 &7. I have to say this is probably the best hotel we have been at in Cork. Staff very friendly, great food and lovely leisure centre. We are regular visitors to Cork and have stayed in many different hotels and I would highly recommend this hotel. Will definitely be back. Excellent. We stayed one night. The room was so comfortable, and warm. Very quiet, and peaceful. Evening meal and breakfast were lovely. Absolutely no complaints. Would recommend hotel to friends. Staff very welcoming and helpful. We had a nice visit to cork, 2 adults & 2 children over St Patricks weekend. Room was nice size and well laid out. Pool was great and kids really enjoyed time spent there. Breakfast was good with nice selection. Dinner was not served in main restaurant but in annex beside lounge area. Was a bit dissapointed with that(setting), but food was excellant, and staff were very friendly. I think they did this to cater for crowd on St Patricks. Nice location for visit into city center and also surronding area. We did trip to Bunrathy which was great. Some nice places to eat in local town, 'Banna' Thai restuarant was great. My daughter and I recently stayed at the Oriel House Hotel and on arrival found the room to be comfortable. However, on closer inspection over the course of the evening we found the menu offered to be very limited and so had to eat out in Ballincollig instead. The carpets in the hotel were patched with tape in various common areas and breakfast the next morning saw a shortage of bacon and egg. All in all I would not be staying at this hotel again and was very disappointed in our stay at the FOUR STAR?? hotel I would rate this hotel as a 2 star. Excellent, lovely hotel, staff very helpful. Had a wonderful stay with family here. All requests were met and had no issues from check in to check out. Photos are a true reflection of the hotel. Lovely building, staff were friendly and hotel was very clean. Food was great and overall it was great value. Will highly recommend. Ballincollig is a lovely area and just a short walk to shops and cafes. Pool was nice. The travel cot in the changing rooms was a great idea for when you have a little one with you. Kid's pool was perfect temperature. Had dinner in restaurant and breakfast. Portions were good size. Absolutely fantastic time had in the Oriel - really good value for money - spacious, clean rooms with comfortable mattresses - we all slept well. Restaurant food and service absolutely top notch - all smiles and food delicious - even music great. Everywhere reallhy clean - pool great - will definately return again soon. Well done to all the staff for making our stay such an enjoyable one - we have passed the message around so expect more bookings! By Peter, We stayed one night and we had a excellent meal in the bar. I would recommend this hotel without hesitation following our experience to any one.